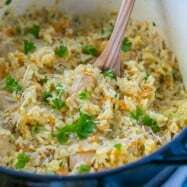 My Mama gave me this chicken plov (rice pilaf) recipe over the phone. I changed it up just a little with a touch of Cayenne pepper. Traditional plov is made with lamb pork or beef. This is our own speedy version. Rice Cooker: Where have you been all these years? 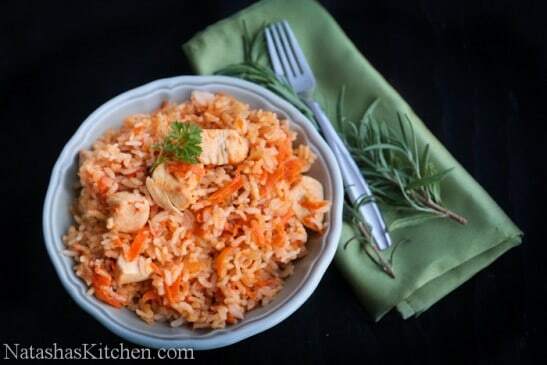 My hubby bought me a rice cooker for Mothers Day and I’ve already made this chicken plov several times. (p.s. It’s a great buy at Costco ~$30) It was so easy and fast. I don’t have to stand over it; I just put my prepped ingredients in the rice cooker and press the button. Voila!! *Use as much water/broth as your rice maker requires. note: If cooking on stove top, add 2 cups water for every 1 cup rice. 1. Heat 2 Tbsp olive oil in a large skillet over medium/high heat. 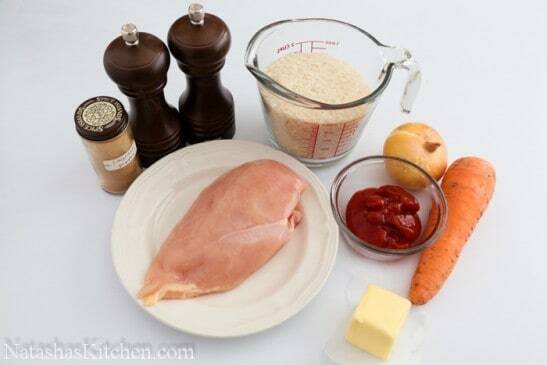 Add chicken pieces, than saute until golden and cooked through. 2. Next, add 1 diced onion to the skillet with chicken and saute about 3 minutes. 3. 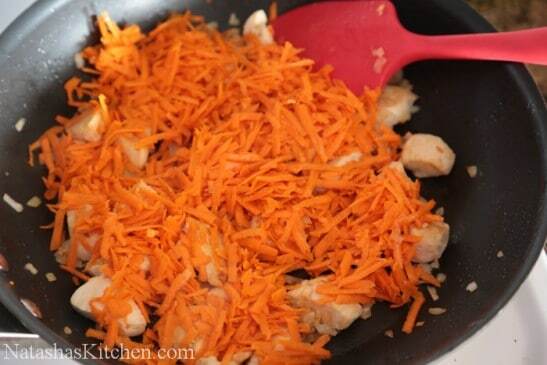 Add grated carrots to the skillet and saute 2 more minutes. 4. Add 2 Tbsp of butter and 1/4 cup ketchup and mix everything together. 5. Once the butter melts, add 2 cups of rinsed rice to the skillet. 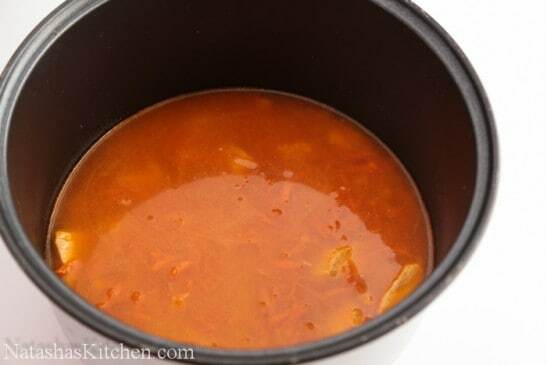 Sprinkle with 1 tsp of salt, 1/8 tsp of black pepper, 1/8 tsp of Cayenne pepper and mix everything together. 6. Transfer mixture to the rice cooker, add 2 1/2 cups of water and season more to taste if desired. Set the rice cooker to “White rice”. Notes: If you don’t rinse your rice, you will require more water. Left over plov is always a good thing; just saute it up. I think its even better reheated in a frying pan. It gives it a certain crunch. Heat 2 Tbsp of olive oil in a large skillet over medium/high heat. 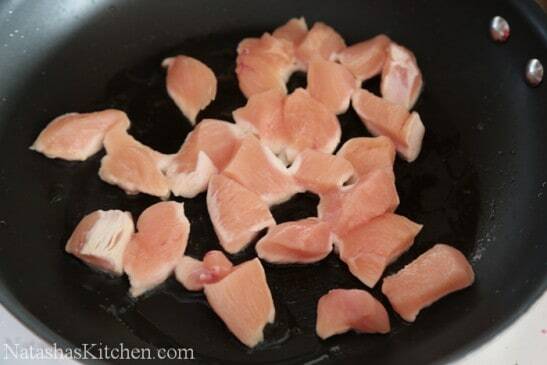 Add chicken pieces, saute them until golden and cooked through. 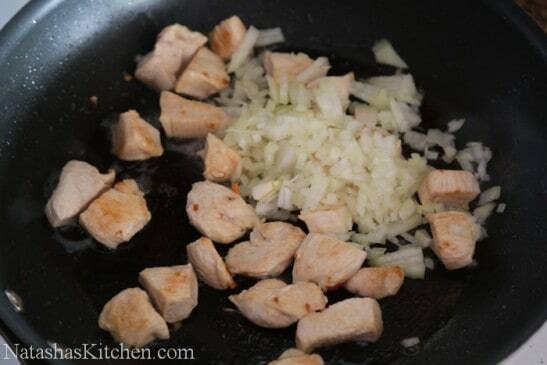 Next, add 1 diced onion to the skillet with chicken and saute about 3 minutes. 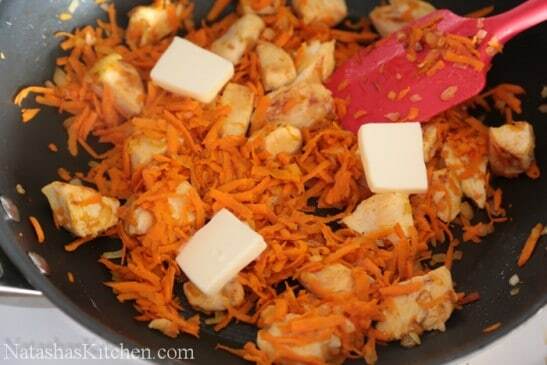 Add grated carrots to the skillet and saute 2 more minutes. 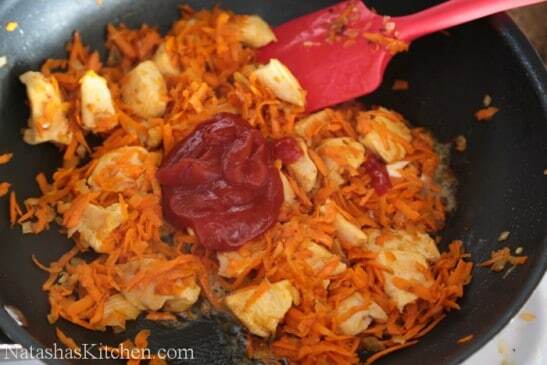 Add 2 Tbsp of butter and 1/4 cup ketchup and mix everything together. Once the butter melts, add 2 cups of rinsed rice to the skillet. 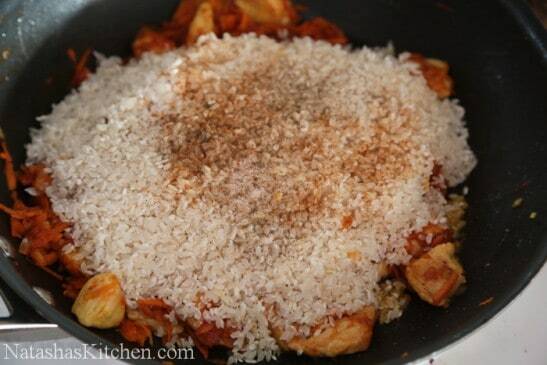 Sprinkle with 1 tsp of salt, 1/8 tsp of black pepper, 1/8 tsp of Cayenne pepper and mix everything together. Transfer mixture to the rice cooker, add 2 1/2 cups of water and season more to taste if desired. Set the rice cooker to "White rice". 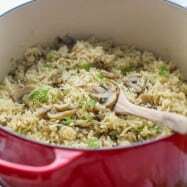 - OR - If you don't have a rice cooker, you can put everything into a pot with a tight-fitting lid and cook over medium/low heat for about 20 minutes, or until all of the water is absorbed. If you don't rinse your rice, you will require more water. Left over plov is always a good thing; just saute it up. I think its even better reheated in a frying pan. It gives it a certain crunch. I recommend to use Jasmine rice. What type of rice and brand would you recommend to get rice that is fluffy and not sticky? Omg omg omg! So good! Can’t belive I haven’t made this sooner! It’s so easy and cooks quick! I used left over chicken and added 2 diced garlic cloves. Soooo good! Hi! 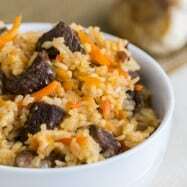 I want to make a plov with lamb! 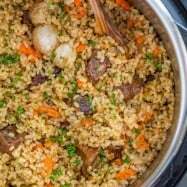 I just bought lamb and very excited 🙂 Can you share a Lamb Plov recipe? Or maybe suggest how to adjust the current recipe? 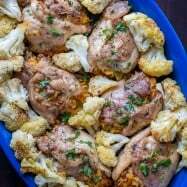 Could I use chicken thighs instead of the breasts? 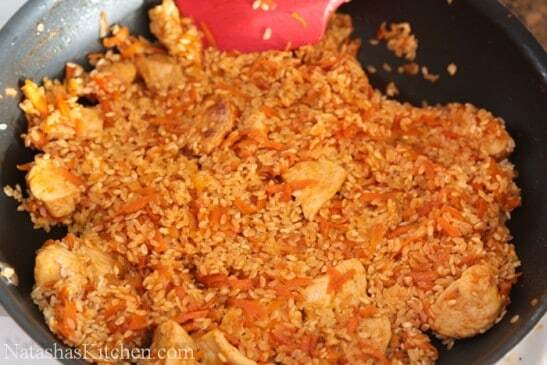 Or does that change the taste of the plov? Hello Natasha, thank you so much for all your beautiful recipes and photos. I love browsing through your site! I made this tonight and the chicken was a little dry. I do not have a rice cooker, so i just left everything in my large non stick pan to cook ( so easy !). I did not transfer it into another pot like you say. The rice got a little browned/ burned on the bottom, but i actually liked it, just like Joel commented above 🙂 I also garnished the plov with sliced tomatoes and cilantro and it was delicious, and helped to cut down on dryness of the chicken. For seasoning, i used a packet of plov seasoning from the russian market (Magia Vostoka), if you haven’t tried it, it is excellent. And i used 2 breasts, not one. Magia Vostoka brand does not have any MSG. Just wonderful aromatic herbs/ spices ans salt. They make all kinds of seasoning blends. Fantastic recipe. (I’m eating it right now.) I accidentally burned some of the rice a little in the final stages (got distracted cleaning dishes), but it adds a nice texture and a good kind of burnt flavor, sort of like how a getting a steak “Pittsburghed” adds to the taste. 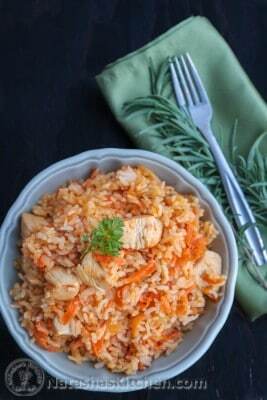 I want to make this & was wondering whether I can pre-cook the rice separately and then mix it (already cooked) into the chicken & veggies, mix everything together, and serve? Do you think that would change the flavour vs. cooking the raw rice WITH the chicken & veggies? (I don’t have a rice cooker). Thanks!! Amazing! Easy, quick and delicious. 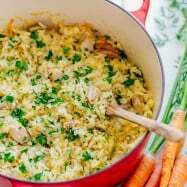 Good recipe for plov. And congratulations on a wonderful Russian cooking blog.